BASF CEO Martin Brudermüller has signed a nonbinding agreement with Chinese authorities to build a wholly owned chemical complex in Guangdong, China. The German chemical giant says spending on the new site could reach $10 billion by 2030, making it the largest investment in the company’s history and the biggest in China by a foreign company. BASF’s project is part of a wave of foreign investments in China totaling $23 billion pledged by various companies in the past week. The catalyst for the proposed investments is China’s removal of a policy requiring foreign manufacturers to form a partnership or joint venture with local Chinese firms. 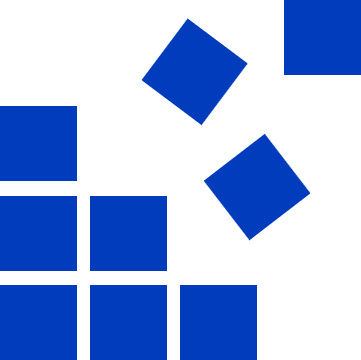 Artemis™ automatically reads, comprehends, and organizes both internal and external business-relevant data. Risks and opportunities are hidden within text and across documents. 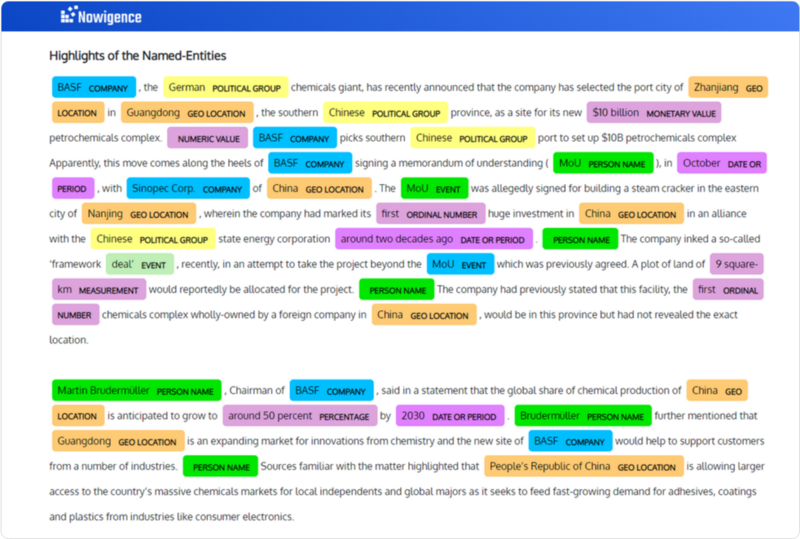 Artemis™ takes large amounts of textual data and quickly classifies it into unique business relevant categories, to be used for various methods of analysis once organized. Our granular extraction methods allow us to identify both major and minor entity categories and capture topics that are sparsely-represented but important to businesses. It is utilized in both an automated fashion, scanning all external data relevant to your business, as well as on an individual basis with single uploads of articles or documents you may choose. Artemis™ takes large amounts of text and shortens it for you, while highlighting major points, in order to provide you with a synopsis that you can quickly read for a more efficient method of discerning information you’re interested in. 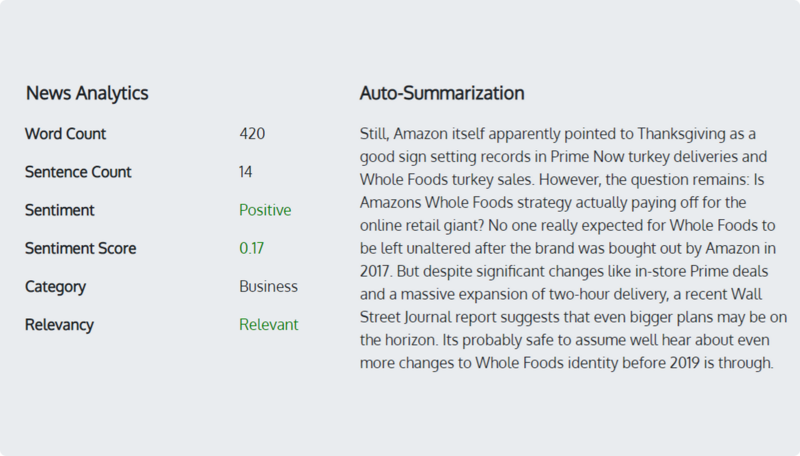 By automatically identifying topics and their relations within a large collection of data, Artemis™ helps you identify shifts in trends, change in competitors strategy, and more. Artemis™ uses natural language processing to analyze text, in order to determine the attitude or feeling behind it, providing you with a specific designation on the overall emotion of a document or content. What types of files can I upload to Artemis™? Depending on the file type, is there a size limit regarding what I can upload? You can upload an individual file up to 1 MB. Each user can store up to 1 gigabyte of data. I’ve noticed an incorrect category “designation” after uploading my file. How do I fix this? You can submit a modification request inside Artemis™ via the feedback button. We will revise accordingly. Can I upload multiple documents at once? Artemis™ only supports one file at a time. You may subscribe to Artemis™ API for batch processing. What does sentiment score mean? And how is it determined? Sentiment score indicates the polarity of emotion in the way news articles were written. We weight each sentence in an article using the positive and negative signals carried by word-to-word co-occurrence.